No, Jed Silver was not a reserve center fielder for the 1913 Sioux Falls team. Jed is alive and well, a Helmar collector with an eye for detail. Recently Jed called me out on our cabinet cards of Del Bissonette, the superb but unfortunate Brooklyn first baseman with a lifetime .305 average. Both our cabinet cards (from the Imperial Cabinet series & the Prominent Newsmakers series) depict a head shot of Bissonette wearing a “NY” cap. For some reason I had assumed that at some point Bissonette had been a member of the New York Giants. Wrong! Jed correctly pointed out that Bissonette spent every minute of his Big League career with Brooklyn. Why then, the “NY” cap? It took a little digging but it turns out that in 1921, very early in Del’s career, he was under contract to a Yankee affiliate. Mystery solved. Little things like this make collecting baseball history fun and even exciting. This gave me an excuse to delve calf deep into the career of one of the more interesting players of the late ’20’s-early ’30’s. 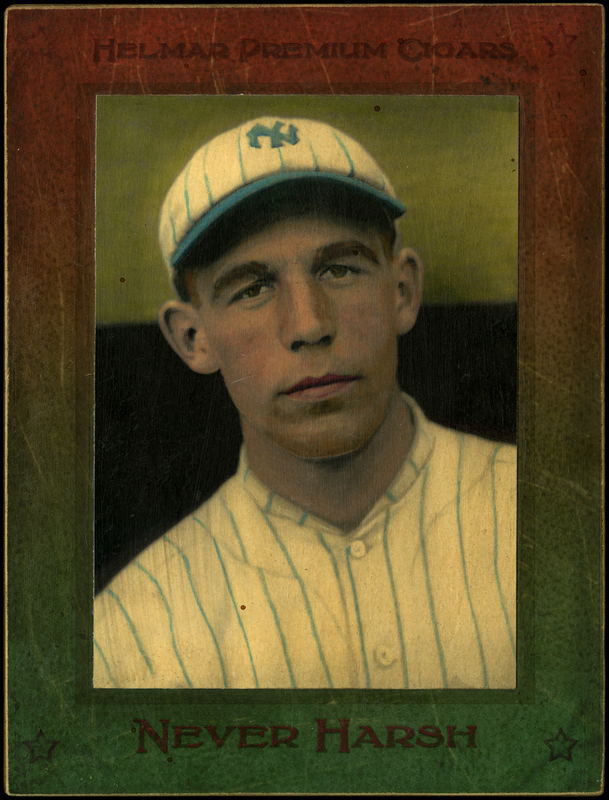 led the majors in games played as a 28 year old rookie in 1928. More homers (25) than any other Brooklyn franchise rookie ever. Managed the 1945 Boston Braves for part of the year. Managed extensively in the minor leagues. Apparently shot himself in the stomach in a Maine apple orchard. Died a week later (1972). Del Bissonette, from the popular Helmar Imperial Cabinet series.